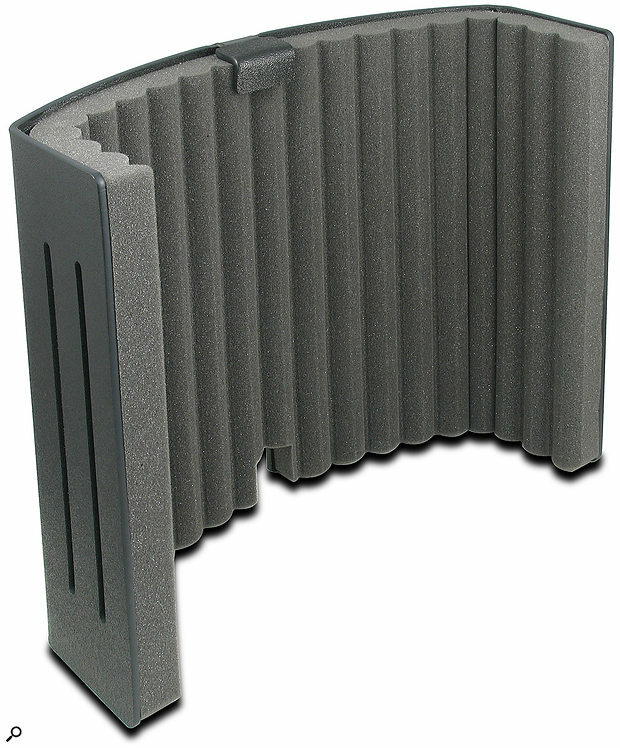 Primacoustic’s VoxGuard and VoxGuard DT are compact acoustic screens, intended for use behind microphones. They aim, like sE Electronics’ original Reflexion Filter, to reduce the amount of reflected ‘room’ sound and spill reaching the rear and sides of the mic. While the VoxGuard includes mounting hardware that allows it to be fixed to a mic stand, the simpler VoxGuard DT we’re looking at here is designed to stand directly on a desk or other flat surface, one obvious application being to help clean up the feed from a podcasting mic mounted on a desk stand. There are further potential studio applications, such as screening a miked electric guitar cabinet, though for more flexible positioning you’d need the full VoxGuard version, which is essentially the same screen but with stand-mounting accessories. Constructionally the VoxGuard DT comprises a 4.5mm-thick ABS outer shell that’s gently curved in front but folds more sharply back at either side to provide the maximum ‘acoustic shadowing’ in the minimum footprint. This is a departure from the more common semi-circle shape, which logic suggests would focus more reflected sound back to the mic’s position. A small aperture in the centre of the underside leaves space for mic cables to pass through. Inside the ABS shell is a layer of fluted, high-density acoustic foam around 22mm thick, and overall the screen occupies a space measuring 457 x 381 x 190mm (WHD). Inevitably, there will be some tonal coloration with this type of screen, as the absorption from such a thin structure is never flat across the frequency spectrum. As a consequence, some energy will still be reflected from the rigid ABS shell that lies behind the foam, and the strength of those reflections will vary with frequency. Yet, eight vertical slots are cut into the shell, presumably to help reduce the amount of low-frequency reflection. Most of the sound that is reflected will reach the rear of the mic, where a cardioid pattern mic (as typically used for vocals) is least sensitive, and the VoxGuard DT’s shape in any case avoids focusing any reflected energy back towards the mic. (In a desktop setting, of course, reflections from the surface of the desk itself are likely to have a much more significant effect on the sound.) In practical terms, when using a VoxGuard DT with a cardioid-pattern microphone for sounds in the speech frequency range, the benefits of increased isolation and reduction in room tone outweigh any minor tonal colourations that may result from using the screen. It can be difficult to judge the amount of coloration caused by acoustic screens, as the change in timbre due to reducing unwanted room reflections often masks what the screen is doing to the mic’s tonality, but in this case, the results in an untreated or lightly treated room are definitely an improvement on not using a screen. This model also has the advantage of being compact, extremely rugged and lightweight.